UNEX Flow Cells are made of heavy gauge steel and support up to 1000 lbs. per level, which is much stronger than tube and joint flow rack systems. Our Flow Cells can be assembled in countless variations to meet any specifications. 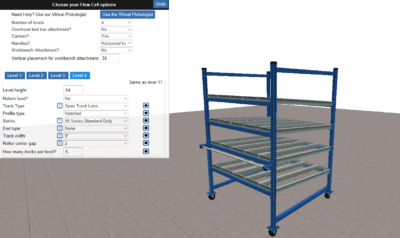 UNEX Flow Cells can be configured as workstations for assembly operations, lineside storage racks to hold parts for assemblies, tilted pick shelves for easy picking of products, mobile carts for picking operations in any location, and more. Assembles in less than an hour, saving time, compared to tube and joint structures, which take several hours to assemble. Ergonomically designed to reduce fatigue and injury. Products on shelves flow easily forward so you don’t have to reach and possibly strain any muscles. One of the best things about our Flow Cells is our Flow Cell Configurator, which allows you to easily build your own Flow Cell solution. The Configurator lets you select the dimensions you need, track types and accessories. Send the design to UNEX and you will receive a 3D drawing of your design complete with a bill of materials. Examples of different configurations are included if you don’t want to start from scratch. Retailers are using UNEX Flow Cells to improve packing operations. The Flow Cell holds products in the right sequence to prevent errors in the packing process. Workbenches can be added to hold boxes as workers add packing materials, which are neatly stored on shelves. Packing stations can be connected to a conveyor, so once boxes are packed, they can be immediately transported to the shipping area, saving workers time without having to walk to another department. Packing stations made of UNEX Flow Cells keep finished orders moving out for shipment so workers can begin to pack the next carton, helping to improve productivity and fulfillment times.